We all know that video is huge in the social media space as every smartphone has a camera and everyone has the ability to quickly become a celebrity or brand ambassador. We also know screens and social networks only have so much real estate and on top of that, attention spans are becoming quicker then blinking. 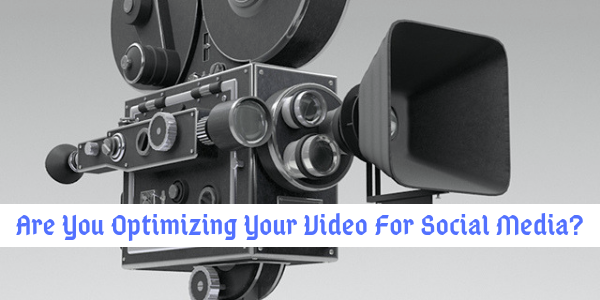 Don’t just post your videos you utilize on other mediums on your social networks. Many times, businesses create videos for multi-channel purposes, including using on television. Don’t just repurpose those videos onto your social networks for the sake of convenience and money. Instead, create a shorter platform optimized version for your various social networks and the various abilities they allow for. You need to brand your videos fast. So many times, people see great videos and have no idea which company they are associated with. It is important that you showcase your brand within the first 3 to 4 seconds of your video. This way, should the video be shared, new viewers can quickly associate the video with the company. Optimize without the use of audio. You need to remember when people view videos via social media; for the most part they are muted by default. That means to have an effective video on social media you need to make sure they can be remembered simply by how people visually view them. That means including textual clues as well as closed captions when this is voice-over narration. For true social video success you need to create instant meaning – basically if you want to keep a viewers attention you need to get to the point in the first few seconds of the video. If not, you are much more likely to lose them. Video isn’t going anywhere. If anything it’s just going to become bigger. For additional ideas on how to best optimize your videos for social media contact The Interactive Imprint today at 954-254-1650 or visit TheInteractiveImprint.com.